Hemingway had starred against Exeter City in an FA Cup tie in 1927 whilst playing for Rotherham United, but the Grecians had to wait for a couple of years before they finally gained his signature. Starting his career with home town club, Rotherham, he netted 22 goals in 67 league appearances for them. He then moved to Torquay United for the 1928-29 season and scored 11 goals in 38 starts. Described as a player with immense shooting power and cleverness on the ball, he was to make his Exeter City debut against Luton Town in a 2-2 draw against Luton Town, scoring one of the goals. 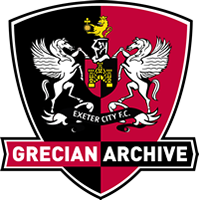 That was the start of a terrific season for the Grecians as he ended up leading scorer with 19 goals in 39 league appearances including one game where he scored four times as City defeated Northampton Town 6-4. Unfortunately for Exeter and their supporters he moved on after just one season to sign for Wolverhampton Wanderers, but he failed to hit the target in four starts for them. He had another spell with Torquay United in 1931-32 adding a further 4 goals in 23 league appearances. At the end of that season he signed for Dartmouth United.